Lemons taste so refreshing. I think that is the appeal of this dessert. I love to make it in my cake is the NordicWare Rose Bundt Pan. It’s like eating one big yellow rose. It makes a very pretty presentation. Of course, any Bundt cake pan or even an angel food cake pan will work just fine for this cake. I hope you enjoy this recipe for a refreshing Fresh Lemon Pound Cake, a from-scratch cake baked in a n easy to decorate Bundt Cake Pan. Grease and flour a tube or Bundt cake pan. Cream the butter. Add in the sugar and continue to cream mixture. Measure out the flour and mix in the salt. Slowly add the flour to the butter mixture. Once combined add in the juice and zest. Carefully pour the cake batter into the prepared pan. Allow the cake to cool for 15 minutes in the pan. Remove the cake from the pan and continue to allow it on a wire baking rack. 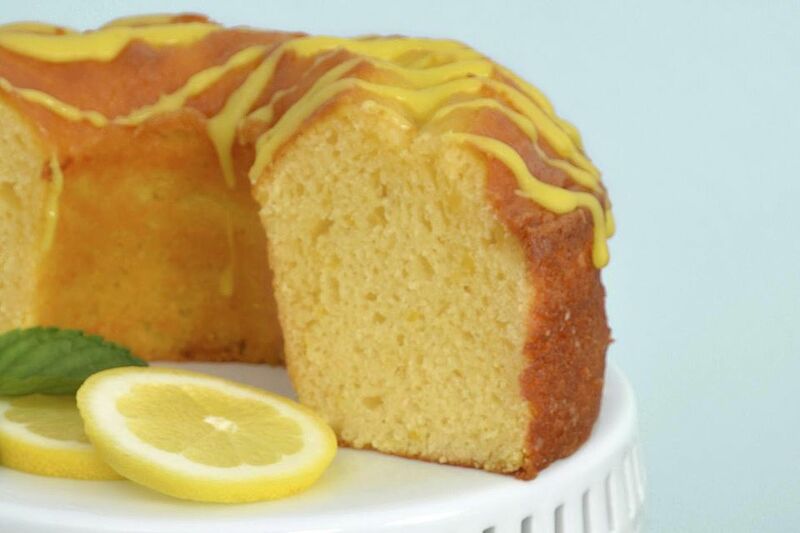 Once the cake is completely cool and placed on a serving platter, make the lemon glaze. Zest the lemon into a medium sized bowl. Juice the lemon into a measuring cup. If necessary, add additional liquid like more lemon juice, lemon liqueur, water, lemonade or lemon soda to make 1/4 cup of liquid. Add the liquid to the bowl with the zest. Stir in the sifted powdered sugar. If the glaze is too stiff, add more liquid. If it is too wet, add more powdered sugar. Decoratively drizzle the glaze over the cake. Serve this Lemon Pound Cake by itself or with a little whipped cream. This cake tastes good almost any time of day. Besides dessert, it’s great with a cup of tea in the afternoon or with a cup of coffee at breakfast. This cake can be stored on the counter in a pretty glass cake container or in the refrigerator in an airtight container. Your Lemon Pound Cake freezes beautifully whole or in pieces. Wrap in the cake in clear plastic wrap, and then place the cake into a resealable container or plastic bag. It should keep up to 3 months in the freezer without losing any flavor.